The tagline for Thirteen Days is “You’ll Never Believe How Close We Came”. Unless you lived through it, the terror of the two-week long Missile Crisis can only be imagined. The world was brought right to the brink of nuclear armageddon when Soviet Missiles were discovered in Cuba by U.S. surveillance in October 1962. Watching Roger Donaldson’s gripping recreation of the events, as seen through the eyes of President John F. Kennedy (Bruce Greenwood) and White House staffers, it is truly unbelievable how perilous the standoff was. Opening with shots of mushroom clouds, Thirteen Days signals its intent and tone. If for no other reason, the film should be of note as a noble attempt to detail and describe the atmosphere and events in the White House. The focus of the story is Kenny O’Donnell (Kevin Costner), JFK’s aide, confidant and friend. His privileged position by the president’s side allowed him access to all top-level meetings and discussions with military and political chiefs. As both JFK and RFK (Steven Culp) discuss/debate/argue with the likes of Adlai Stevenson, Dean Rusk and General Curtis LeMay, Russian ships are approaching Cuba, and time is running out. As the U.S. blockade is put into place (under the watchful eye of Robert McNamara (Dylan Baker)), and the United Nations becomes involved, the U.S. and the U.S.S.R. go head-to-head. Despite now knowing the inevitable outcome, the tension is palpable throughout Thirteen Days. Whether the standoffs occur in the Gulf of Mexico or the Oval Office, they are never less than involving and rarely less than intense. David Self’s script, based on May and Zelikow’s book “The Kennedy Tapes – Inside the White House During the Cuban Missile Crisis”, details each meeting and negotiation in the White House but, by focusing on O’Donnell, also allows us a glimpse at the human cost of these events (O’Donnell was married with five children). Costner does fine (despite a shaky ‘Bah-stan’ accent). Greenwood and Baker inhabit their roles with dignity, whilst Culp captures Bobby Kennedy perfectly in both mannerisms and physical appearance. The twists and turns in events come thick and fast, with Donaldson refusing to either slow the pace or become overly maudlin. 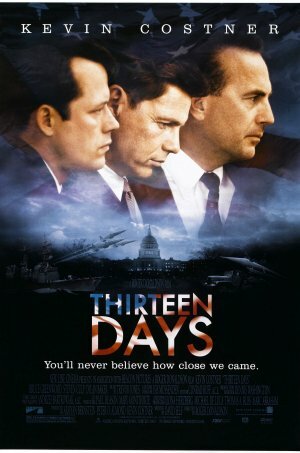 Any grunts about the CGI or the 145-minute runtime are overruled by the commitment of cast and crew to a realistic representation of all-too-real events, and as such, Thirteen Days excels.